Fowler School of Law students assist senior citizens in need as part of the ongoing work of the Alona Cortese Elder Law Center at Chapman University. Each year, more than 5 million older persons are abused, neglected and exploited in the United States. Elder citizens lose an estimated $2.6 billion annually due to elder financial abuse and exploitation, according to the U.S. Department of Health and Human Services’ Administration for Community Living. Yet very few systems exist to help combat this abuse. , aims to increase public knowledge of the growing social justice movement to end elder abuse and improve the lives of senior citizens. Sunday, June 14 at Laguna Woods Village at 1:30 p.m. 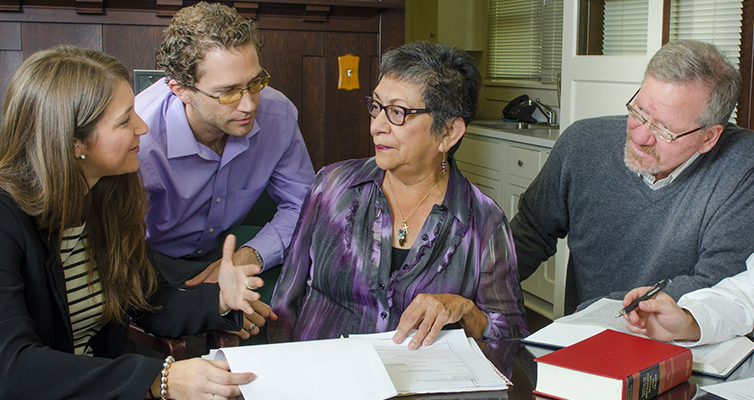 The mission of the Alona Cortese Elder Law Center is to offer free legal services to the elderly and needy of Orange County, while at the same time providing Chapman University Fowler School of Law students with a variety of cases that will increase their legal knowledge and skills. The Center also educates law students to become more effective young lawyers entering their profession, and exposes them to critical areas of the law affecting the elderly, the developmentally disabled and the mentally ill. The Center also strives to show students the joys and benefits of pro bono lawyering. , the Fowler School of Law at Chapman University emphasizes personalized traditional legal instruction, real-world skills training and professionalism. The law school is located in Orange County, California, and is known for its excellent faculty, collegial atmosphere and personalized education.